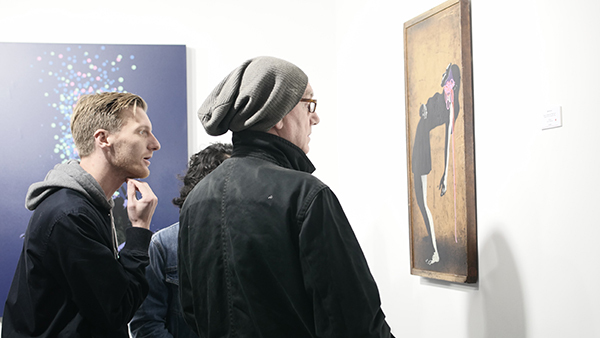 Our current exhibition 'Dance Boldly Through The Storm' by renowned street artist Eelus is now open to the public following last week’s private view. We’d like to say a big thank you to everyone that attended the opening evening. 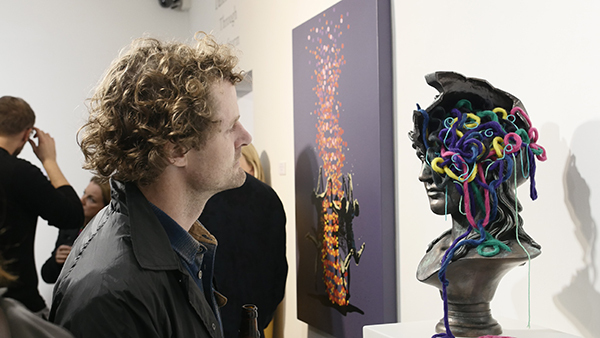 It was fantastic to see so many fans, art collectors, friends of the gallery and other esteemed artists (including Ben Eine, Ryan Callanan and Dan Hillier) in our Central London space, all eager to view first-hand Eelus’s brand-new body of work. 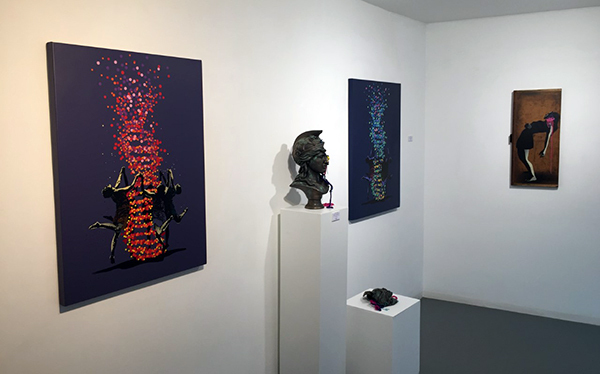 'Dance Boldly Through The Storm' is Eelus's first London solo show for 7 years and continues on from his most recent 'The Dark Side of the Rainbow', held in San Francisco in 2016, which was a sellout. 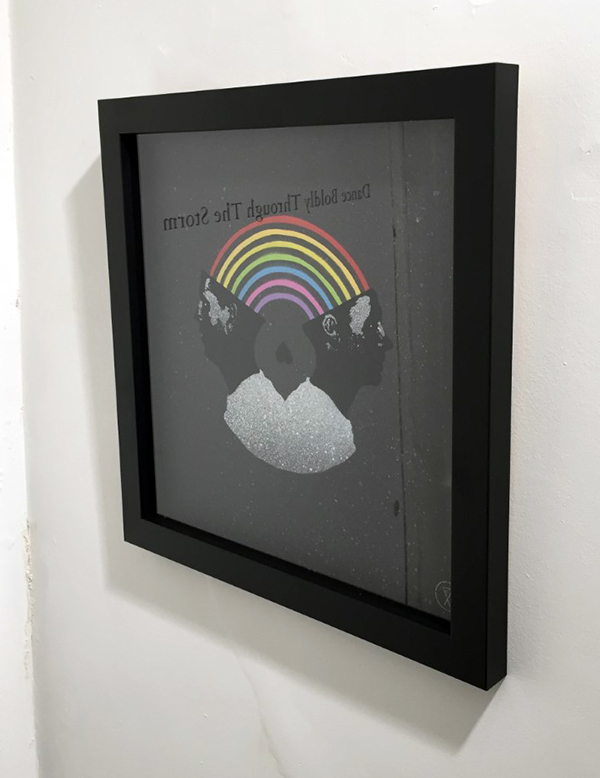 Upon entering the gallery visitors are met with the pair of canvases ‘We All Fall Down – 1 & 2’, which have been expertly translated into limited edition silkscreen prints. The special edition of 15 was released at our stand at Moniker art fair and sold out in a matter of hours. Meanwhile, the standard edition of 50 launched alongside the exhibition and is virtually sold out now with less than 10 prints remaining. Alongside the canvases, is the central bronze sculpture ‘A History of Nonsense’, mounted on a plinth and taking pride of place on our gallery ground floor. 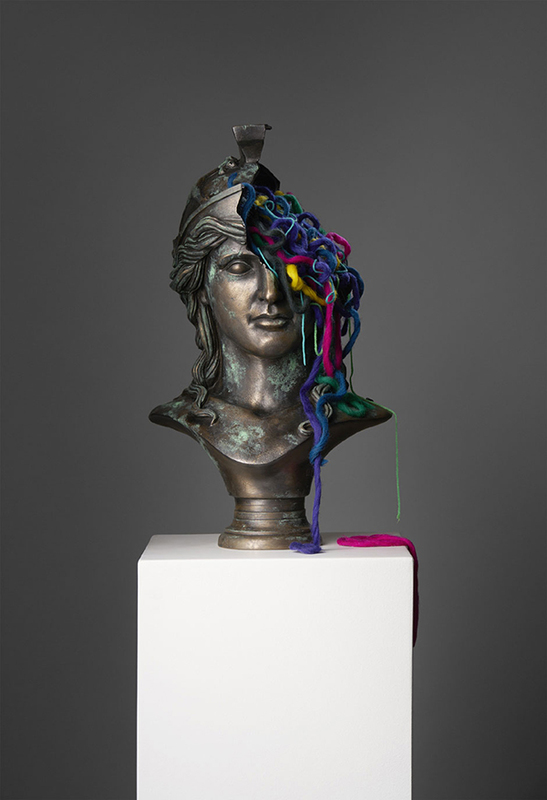 As with all of the bronze works in the exhibition Eelus has counterbalanced the industrial, man-made aspects of bronze with tangled balls of colourfully dyed natural Peruvian wool. Eelus has also created a pair of works ‘Subject 24’ and ‘Malfunction’ on antique wooden trays, each of which creates an intriguing dialogue between the sleek and accurate stencil work and the roughly textured found object. 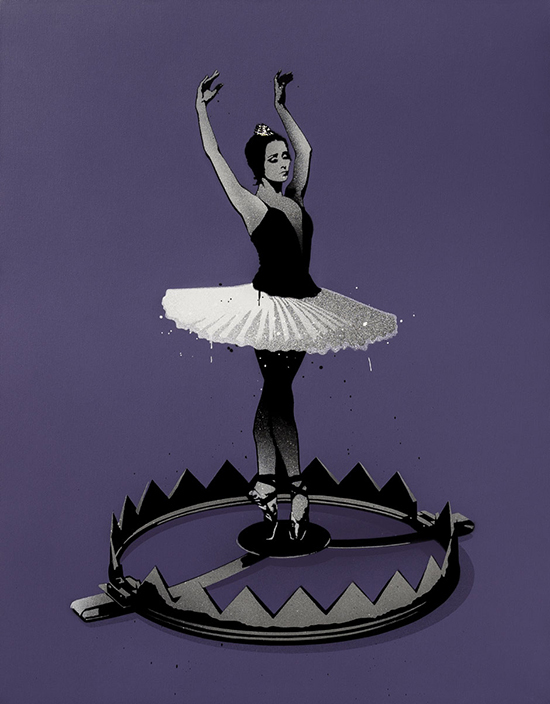 The exhibition’s title piece, the majestic ‘Dance Boldly Through The Storm’, displays an elegant ballerina in a pointe pose, seemingly unaware of her perilous position in the centre of a tightly sprung bear trap. On the stairs of the gallery, you’ll find Eelus’s sophisticated critique of social media trends with his piece ‘Anti-Social Network’. 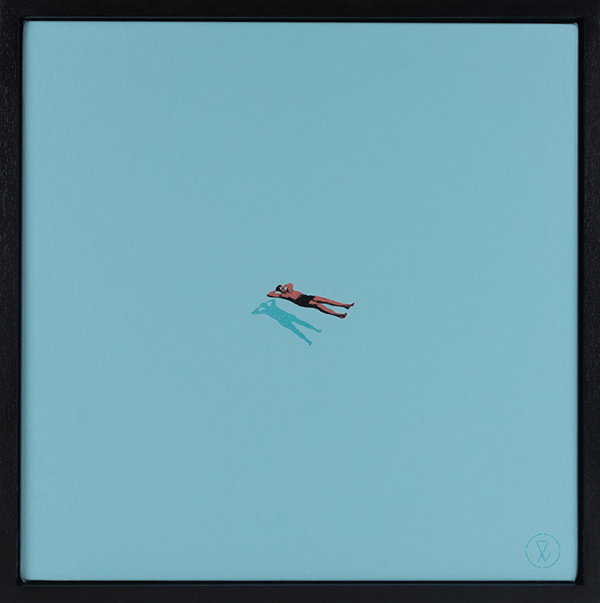 Traveling downstairs visitors are immediately met with the meditative and serene canvas edition ‘Adrift’, depicting a lobster hued sunbather effortlessly floating. Also located in our basement you can see more of Eelus’s wooden sculptural pieces; 'Dreaming of An Exit', ‘The Townsfolk Acted Real Strange From That Day On’ and ‘Doom Hypnotic 1 & 2’. 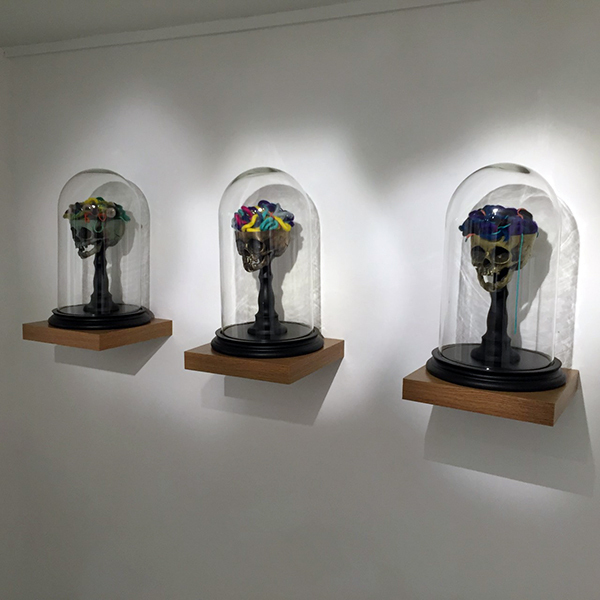 There are also a trio of Eelus’s captivating bronze skulls ‘Colly-Wobble’, ‘Heebie-Jeebie’ and ‘Dilly-Dally’, all encased within Victorian era bell jars. The original cast was made from a mold of a real 12-month-old human skull. Dance Boldly Through The Storm is an exhibition that demands to be viewed in person in order for the detail and intricacies of the work to be properly communicated. Dance Boldly Through The Storm runs until Saturday 11 November. Follow this link to view all available work by Eelus. For sales enquiries please contact the gallery on +44 (0) 20 7240 7909 or email us at info@lawrencealkingallery.com.